Barbara Luster, our librarian made this bulletin board for the Dallas Christian Accelerated Reader program this year. 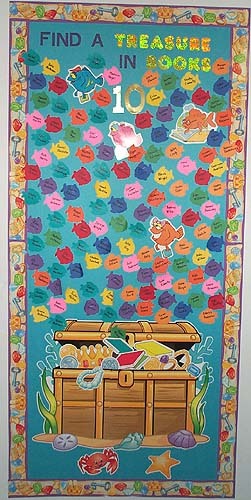 The board features an underwater scene complete with fish nets. The children's pictures are mounted on sea creatures ; a different creature for each grade level. She used shaped notepads such as the octopus, crab, and whale. You can look for fish-shaped notepads here . She glued the picture on, wrote the name, then laminated the shape. As they gain more points in the AR reading program their creature is moved to the next level. This is the first step, the 10 point level. Press "Go" to search for books about the Ocean.